Over the past several years, airlines have taken steps to differentiate their classes of product segment in order to maximize revenue. Cabin configurations traditionally consisted of either two classes (economy and business class) or three classes (economy, business and first class). Now planes are configured with four or even five cabins, with the more recent additions being premium economy. In many cases, premium economy has become the new “middle class” as airlines have done away with first class, and are flying with planes that have standard economy, premium economy and business class. Let’s take a closer look at premium economy products by comparing the products and services offered, as well as the booking process and elite upgrade rules. Delta’s premium economy offering is called Comfort+. This product is clearly the best of the three legacy airlines. Comfort+ seats offer 3 inches of additional leg room compared with standard economy seats. The seats are located in front of the main economy cabin, so you will be able to exit the plane faster. There is dedicated overhead bin space so you don’t have to worry about your roll-aboard getting checked at the ramp. You receive priority boarding so you can get on the plane and get settled more quickly. Delta offers complimentary alcoholic beverages including beer, wine and spirits. The seats include both connectivity and power so you can charge your devices while you fly. You will have a choice of a variety of complimentary premium snacks instead of just the standard offerings like pretzels and peanuts. Longer transcontinental flights include additional sleeping and entertainment amenities such as a pillow, blanket, complimentary headset and amenity kit. The seats on these flights also recline up to 50% more than standard economy. In addition, since this is a true premium economy product, it is being sold as a separate class of service. This means that the seats can be booked directly as an award ticket for a price between the standard economy price and business/first class price. Elites may be upgraded along with one companion traveling on the same reservation. In a tweak to the program, companion upgrades are now based on the highest elite status of the two people. Previously, upgrades cleared based on the lowest status, which was very irritating to higher level elites who may have been passed over by passengers with a lower level of status because their companion had an even lower status. There is one significant downside to the way Delta handles upgrades into Comfort+ seats. 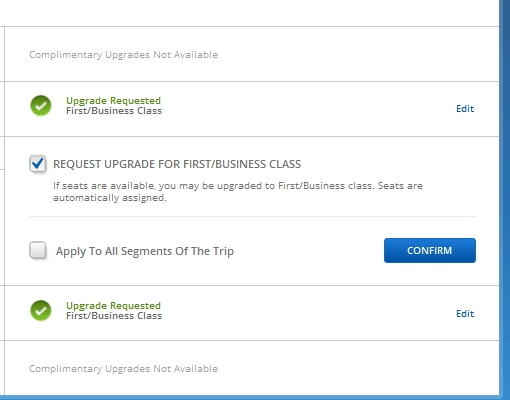 If you are cleared for an upgrade, the upgraded seat is automatically assigned based on availability. Therefore, you could have reserved a window or aisle seat in standard economy and be “upgraded” to a middle seat in the Comfort+ section. You will have to decide for yourself what is more important: avoiding a middle seat at all costs, or the extra legroom, snacks, and free drinks offered in Comfort+. American does not have a true premium economy offering on domestic flights. However, it does have a product called Main Cabin Extra. Some people simply refer to these seats as “extra legroom seating”. The list of amenities is quite short. The only real benefits are extra legroom and a position in the plane in front of the standard economy seats. Unlike their true premium economy seats on long haul international flights, these Main Cabin Extra seats are not a separate class of service. This is nice because it means that an upgrade is not required; you simply select the seat at the time of booking. Main Cabin Extra seats are highlighted in red, and the price is displayed for those who do not receive complimentary access. 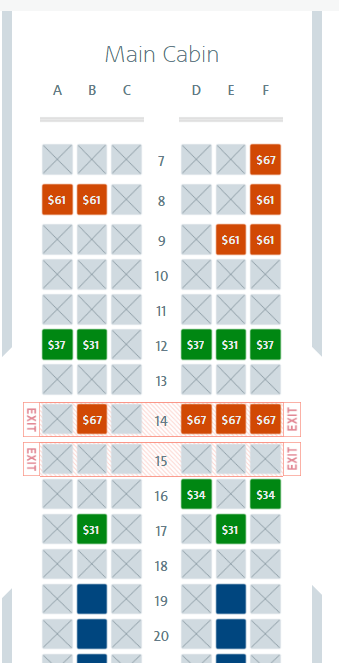 As you can see, some of the seats that cost extra are simply the exit-row seats and are not located as far forward in the plane as the rest of the Main Cabin extra seats. AA elites with Platinum status or above have complimentary access to these seats. Gold elites may select these seats and receive a 50% discount at booking, and complimentary access if seats are still available within 24 hours of departure. United has different rules for elite access and guest privileges. Those with Platinum elite status and above receive complimentary access for themselves and up to eight companions at the time of booking. Those with Gold elite status receive complimentary access for themselves and up to one companion at the time of booking. Silver elite members may receive complimentary access for themselves and up to one companion at the time of check-in.